Some people refer to a visit to Israel as the fifth gospel. I guess it’s because everything you read about in the Bible comes to life when you walk where Jesus walked. 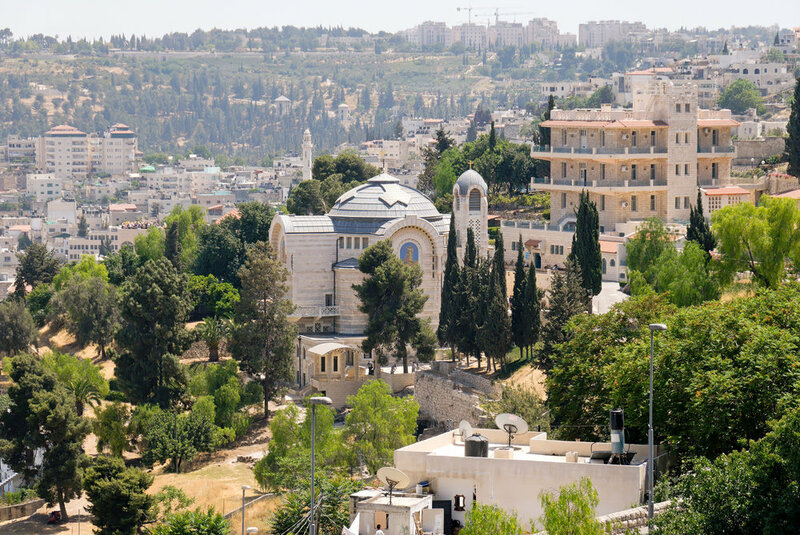 Visiting the Holy Land engages not only one’s thoughts and emotions, but also the senses. Seeing the cities and towns where narratives in Scripture took place, hearing the bleating sheep on the hills outside Jerusalem, sitting on the same hillside where Jesus preached, and smelling the sea where he calmed the storm, makes those passages you’ve read countless times come to life. With Good Friday and Easter on its way, I can’t help but think back to our trip to Israel last year. I recently read the account in Matthew when Jesus was arrested and could see the Garden of Gethsemane in my mind, with its gnarled olive trees and quiet solitude. After his arrest, Jesus was first taken to Annas’s home and then on to the home of Caiaphas, the high priest. Caiaphas was one of those behind the plot to have Jesus killed (John 18:14, Matthew 26:3-4). Peter stood out in the courtyard and waited to see what would happen. On our trip to Israel, we went to that courtyard where a statue of a rooster now stands. We then went to an underground prison beneath Caiaphas’s home where Jesus was likely held the night of his arrest. It was a deep, dark pit. There was one light dimly illuminating the room for us, but I could easily imagine what it would have been like turned off. I thought about the time our family went on a tour of a cave in the mountains of Tennessee. At one point on the tour, the guide turned out the lights so we could experience what it was like for gold miners when their lights were extinguished. It was the darkest place I’d ever been. Complete darkness. That’s what I imagine the pit in Caiaphas’s dungeon would be like without electricity. With two dozen of us crowded inside, we read Psalm 88 and sang a hymn. Reading the psalm in the place where Jesus spent his final night before going to the cross, struck me in a way it hadn’t before. in the regions dark and deep. Like all of Scripture, each psalm has a here and now meaning for the author who wrote it. Psalm 88 was written by Heman, one of Israel’s worship leaders. As a worship leader, he wrote songs to help God’s people sing to God during all of life’s circumstances, both in the joys and in the sorrows. In Psalm 88, we can see that the psalmist obviously endured a significant trial in his life. He was in despair. He cried out to God day and night. He felt the weight of God’s judgement and the abandonment of his friends. God seemed far away—so far, darkness had become his only friend (v. 18). But also like all of Scripture, Jesus fulfills Psalm 88. As Luke 24:27 tells us, when Jesus walked on the road to Emmaus with some of the disciples following his resurrection, “And beginning with Moses and all the Prophets, he interpreted to them in all the Scriptures the things concerning himself.” In Psalm 88, we hear Jesus with his friends in the Garden before his arrest echoing the psalmist, “For my soul is full of troubles, and my life draws near to Sheol” (v. 3). Jesus stepped into the darkness on our behalf. The night he spent in the pit was only the beginning of all that he would endure for us. He felt the full weight of God’s wrath at the cross in our stead. “Your wrath lies heavy upon me, and you overwhelm me with all your waves” (Psalm 88:7). He too was abandoned by his closest friends (v.8). Christ took on the curse of death, the darkest of all pits. After my visit to that underground pit beneath the home of Caiaphas, I now read Psalm 88 with greater joy than ever before. I still rejoice that I can come to the Father and voice my sorrows, no matter how dark. I still turn to him in lament and ask for his help and rescue, trusting in him as my salvation. But I also rejoice, knowing that my Savior endured greater darkness—God’s wrath for sin—on my behalf. When it seems as though I’m stuck in a pit of despair, I remember Jesus and the lengths he went to for my redemption. He went to dark places I will never have to go. And for that I rejoice. After a recent talk I gave, an attendee shared that Psalm 88 was her favorite psalm. For those of us familiar with it, we might hear such a comment and raise our eyebrows in confusion. While other biblical laments end on a note of trust and worship, this one ends without any light or hope. It simply concludes, “Darkness is my closest friend.” The end. Despite the dark tone, however, there is hope to be found in Psalm 88. Here are four reasons...to read the rest of this post, visit The Gospel Coalition, my writing home today.